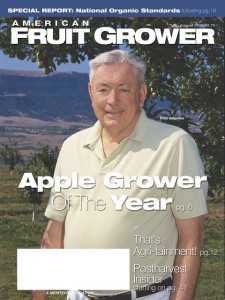 Fred Valentine, American Fruit Grower® and Western Fruit Grower® magazines’ 2002 Apple Grower of the YearSM, passed away Dec. 4 at his home in Wenatchee, WA. He was 81. Valentine was known for pushing the industry to grow high-quality fruit to net robust returns. Valentine began his career as a fieldman with Northwest Wholesale and spent three years with the company before being hired as a horticulturist by Blue Star Cooperative. He stayed at Blue Star for about 35 years and helped turn them into a major packinghouse for pear growers. Valentine was a senior fieldman with Van Well Nursery at the end of his career. Van Well remarked on how closely knit Valentine’s family was. He told a story of how about three years ago Valentine wanted to take his grandson to the Smokey Mountains – where Valentine is originally from – for spring break. Although spring is a busy time for the nursery, Van Well agreed. 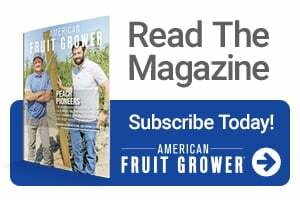 “We had talked to a grower of ours in Sevierville, TN, and [Valentine] said ‘I’m going to be there’ and the grower said ‘My trees are coming in, tell Fred if he comes over and helps me plant, I’ll buy him lunch.’ So Fred and his grandson were there when the trees arrived and they went out the next day and they were planted. “The thing I remember is when he got back from that trip, Fred seemed like he was 10 years younger. He had taken his grandson back to where he was from, back to his roots, and they were out there planting apple trees of all things. 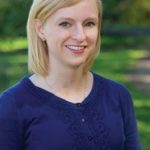 Valentine’s passing is the second in the Washington tree fruit industry within a week with the death of Bill Evans as well. “It was a shame we had two legends pass away at the same time,” Van Well says.